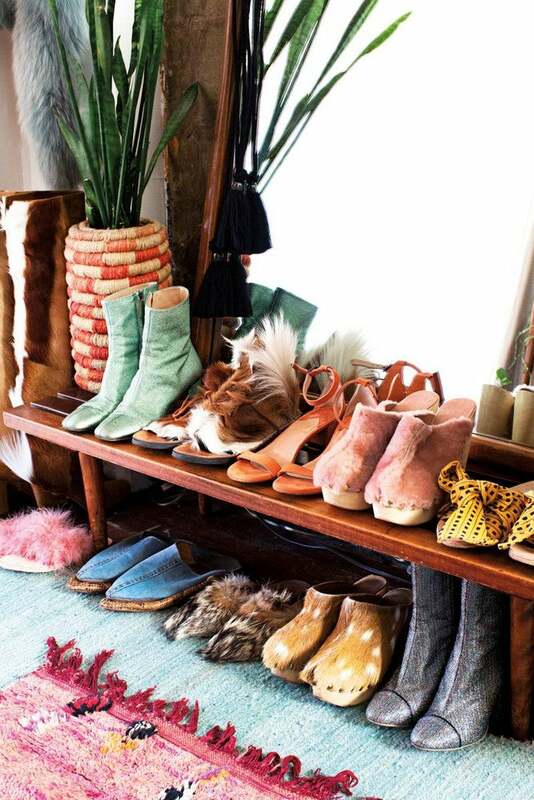 If there is one thing we can collectively agree on, it’s that there can never be enough shoe storage. Whether you are taking the shoe rack route, over-the-door storage, or the highly-coveted built-in approach, you are always left with a lingering few pairs that remain forever homeless, cluttering up either the floor of your closet or the entryway. And since no one wants to deal with the eyesore that can result from a stockpile of dirty shoes, a clever storage solution is most definitely in order. In the vein of preserving your sanity, and for the sake of minimizing the amount of clutter that can accumulate from the aforementioned scenario, we set out to uncover the clever shoe storage solutions that will help you do just that. Because sometimes, a custom, built-in shoe rack isn’t entirely practical. Read on for the best shoe storage hacks we found. When it comes to clever shoe storage hacks, rolling shoe racks are definitely high on the list. Not only do they keep your floors clutter (and dust!) free, they also allow easier access to your favorite pairs. With those lingering few pairs in mind, take a page out of designer Leanne Ford‘s book and sneak in a statement shoe (or more) within an existing shelving unit. Bonus points if you can keep it all in a complementary color scheme. If you’re really lacking the closet space, designate a subset of your shoes for a curated display. Allow designer Aurora James’s little “getting ready” nook to stand in as inspiration. Line a low-standing shelf or bench with your shoes—utilizing both the top and bottom—and pair the setup with a mirror casually leaning against the wall. Place a compact shelf at the base of a free-standing clothing rack to store an edited down version of your seasonal shoe collection, just as Jessica Walsh did in her Chelsea apartment. A grid fastened to the wall provides ample space for storing all sorts of (heeled) shoes and accessories. We can’t get enough of the chic color block of this modular system, which features a multitude of spaces and surfaces for shoes of all shapes and sizes. Shoe cabinet, console, you decide. This minimalist storage unit is both sleek and spacious, and hardly takes up any floor space due to its clever design. Get the scoop on how you can personalize this IKEA staple on House Tweaking. For the small-space that lacks an entryway or hall closet, we’re all for a storage solution that packs everything into one. Case in point? This clever organizer that comes complete with a multi-level shoe rack. Utilize under-the-bed-storage to keep shoe clutter to a minimum. This pull-out shelf, composed of a cabinet and a set of wheels, will do the trick! All you need for this quick and easy DIY are a few wood board pieces, paint, and adhesive. This custom shoe shelf makes for a minimalist storage solution, perfect for tight spaces. Get the scoop on Style by Emily Henderson. When floor space is at a minimum, utilize the walls for storage. These hooks not only provide a uniform source for storage, they also keep the area clean and organized. Designate this mini ladder shelving system to an empty corner, and use it to house the shoes you wear most often. Plus, the top shelf can also function as a spot for holding accessories and small trinkets! Get the how-to on DesignSponge. Conceal an open shelving shoe storage situation by installing a long curtain above the top shelf. If it’s located near the windows, opt for matching drapes for a more cohesive look. Designate a wall in a closet, or even the back of the door, as a spot for storing shoes. Line the wall with rows of towel rods and hang your shoes on them. This story was originally published in September 2016; it has been updated with new information.